Here’s an unusual image to start our TBN blog with, and yet highly relevant to Friday’s keynote content at the Hampshire meeting of The Boardroom Network. Our meeting was about how we need to, “Start with the end in mind,” (Stephen R Covey), articulated clearly, concisely, and convincingly by Action Coach’s Kevin Stansfield. Richard Mack entertainingly reminded us not only of how important it is to be memorable but also of how memorable many of our members are! 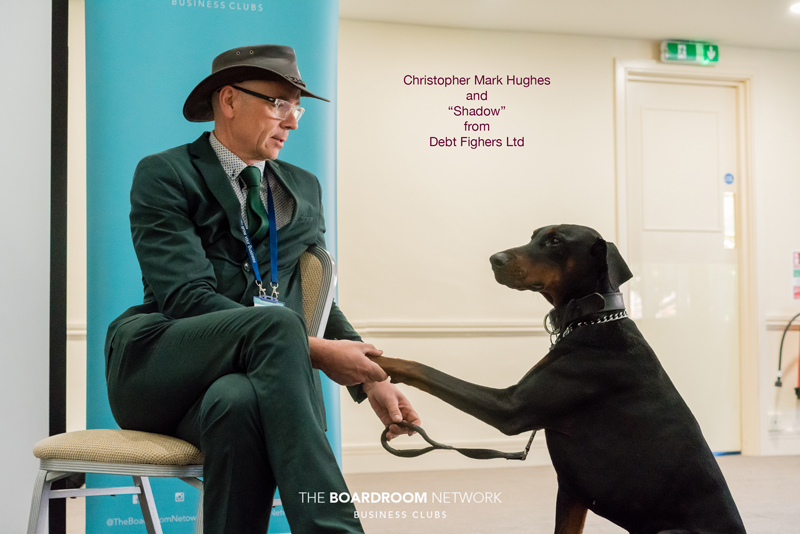 Finally, Boo Donovan and Christopher Mark Hughes – ably supported by the enigmatic ‘Shadow’ – demonstrated the power of Emotional Intelligence to create a better Endgame. For those who know about Mind Mapping, Memory Skills, World Memory Championships, and Mensa – Tony Buzan has a giant reputation. A force of nature – for the good of the millions who have read his books and have gone on to act on his practical suggestions. Tony has had an enormous effect on my networks. Through him, doors opened that led to meeting all of you. 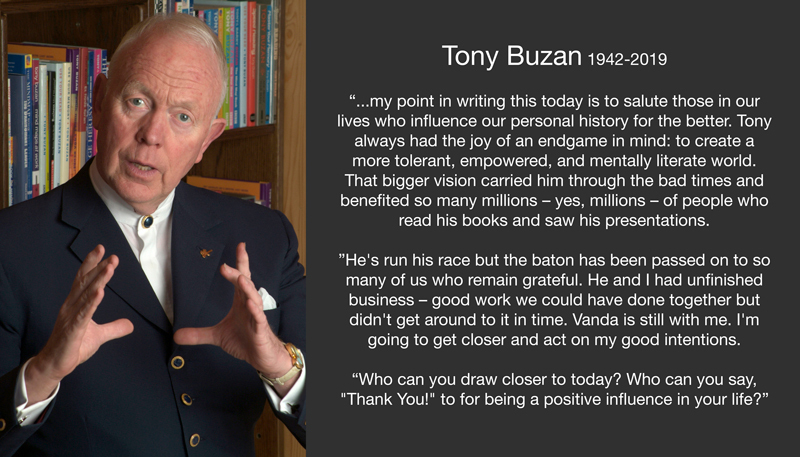 Without him and his amazing collaborator, Vanda North, I would not have moved to Dorset and become a Master Trainer for what was Buzan Centres (in Poole). I am therefore very grateful that Tony had a very clear endgame that wasn’t dependent on him alone. Tony’s vision was to get a sufficiently large number of people thinking differently that we would have Intelligent Networks on Planet Earth. The Boardroom Network and Elite Business Women are examples of such Intelligent Networks. “Be!” I shouted out with instant and absolute confident certainty! Suddenly, Kevin’s presentation made absolute sense of my life. And I wasn’t the only one to be caught out! A large proportion of our members said, “Do!” assuming that it is action that is the most important aspect of the formula. I get where they were coming from! Action is the key! After all, Kevin’s from Action Coach! 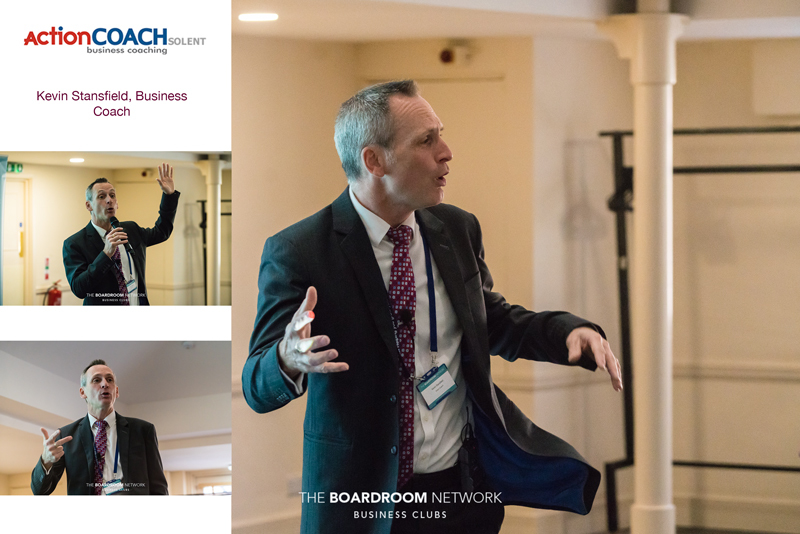 Kevin’s point was that until we know the end result – what we want to ‘have’ – we cannot accurately define the ‘being’ and the ‘doing’ that we need to put in place in order to get the right result. 🙁 What a numpty I’ve been – thanks, Kevin! I show my ‘vulnerability’ here only because I believe I’m not the only one in the network like this. What do you want to ‘have’? Once you’re clear on that, reverse engineer your strategy to work out who you need to ‘be’ and what you need to ‘do’. We’re going to keep Richard’s quiz a secret for now… in case he runs the quiz at one of our other meetings. And, of course, Richard can help you become tangibly memorable. Having promotional items you can leave with people – items that they will value – is a powerful way to have an ‘echo’ after your face-to-face meeting. Curious about others (we call it ‘nosey’). Not afraid to be vulnerable. Empathy is an essential aspect of Emotional Intelligence – and Emotional Intelligence is regarded as the most reliable predictive indicator of future success in Life and business. The article also states that 90% of top performers are also rich in Emotional Intelligence. More than this, those who demonstrate Emotional Intelligence earn more! What’s not to like? This sounds like a business imperative to me. Maybe we should have an Emotional Intelligence department alongside marketing and human remains (HR)? 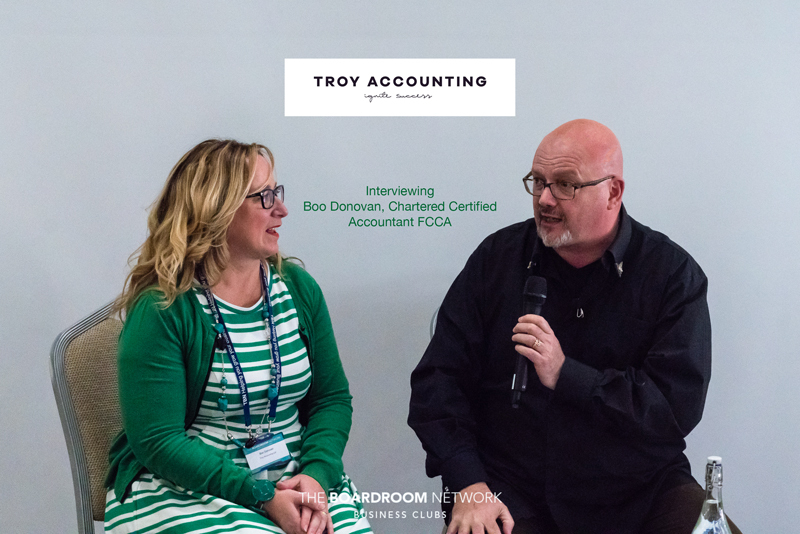 To demonstrate the power of these six indicators, we had the pleasure of inviting Boo Donovan, Christopher Mark Hughes, and the beautiful ‘Shadow’ to the front of the room. Whilst the consensus was that the session needs way more time, I believe the point was made – animals are emotionally intelligent and they bring out the emotional intelligence in us – the best in us. And, thankfully, Accountants and Debt Fighters can also be Emotionally Intelligent – as in the cases of Boo and Christopher – bringing out the best in our businesses. Their passion for making a positive difference was broadcast clearly. I know who I want on my team! Ian Skinners BIG initiative has a well chosen name. He’s thinking BIGger. How could we join him in thinking on a grander scale? Not everyone is comfortable presenting to the whole group. Truth is, I don’t know of anyone who is comfortable addressing their peers as we do through the keynote slots. As an experiment, we invited Boo and Christopher to give this a go, and they were brilliant. Boo remarked on how comfortable she was made to feel – almost like chatting in the lounge. Christopher had the added support of the mighty Shadow. 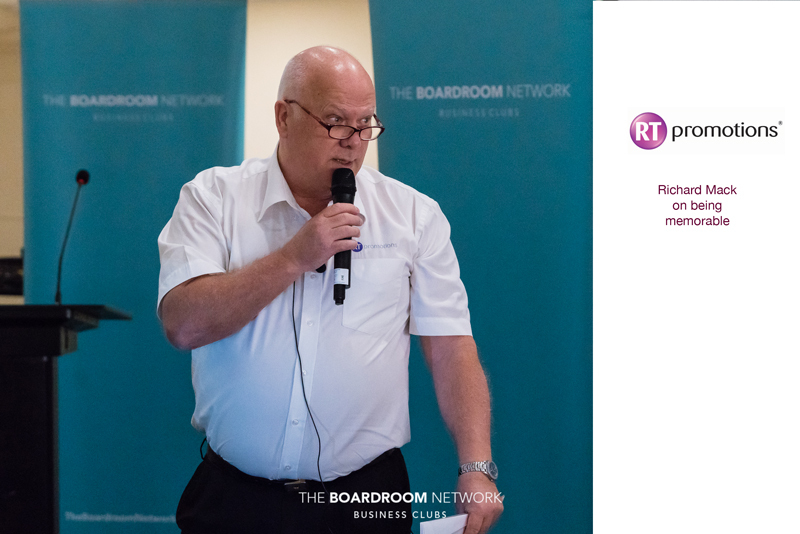 Let’s move forward with this The Boardroom Network Members’ Lounge idea and have more interviews as keynotes in future. If you’d like to be interviewed, please drop Jacqui or Jay a note. Our thanks go to Jacqui for organising and orchestrating such a good event, and to Jay for masterfully managing it. Further thanks to Justin Wharmby for the excellent photographs. And huge thanks to you for being such great members of our network. I’ve connected with a motivated group of students from Bournemouth University who want to set up an Instagram challenge. They are looking for business owners who haven’t got a clue how to get going with Instagram and yet sense that it is important for their marketing. This is a high value opportunity that is absolutely free for the people that meet their criteria. Message me, Lex, directly if you want ‘in’ to Instagram!